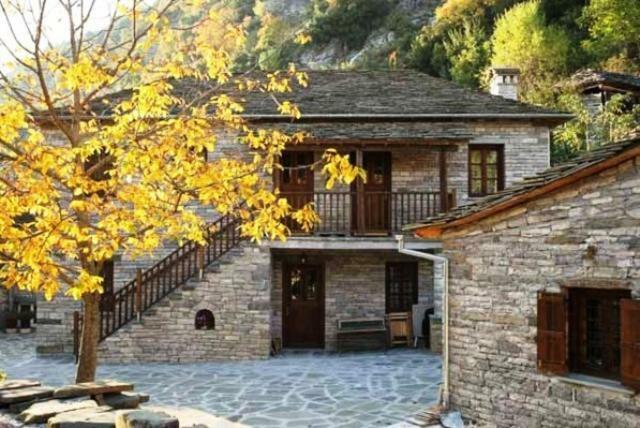 Just a 3-minute walk from the center of scenic Kapesovo, stone-built Terpsichori Guest house features traditional rooms with a decorative fireplace and views over the village square or Mount Gradista. A homemade breakfast buffet is served in the rustic-style dining area. Featuring handmade curtains, carpeted floors and wooden ceilings, rooms at the family-run Terpsichori are equipped with a TV. Each has a private bathroom with shower. Taverns and cafés are within a 3-minute walk. The famous Vikos Gorge is at 12 mi. The town of Ioannina is 26 mi away. Staff at the tour desk can provide information on hiking and kayaking facilities in the area. When would you like to stay at Terpsichori Guesthouse? Τraditional room with a decorative fireplace and views over the village square or Mount Gradista. Features handmade curtains, carpeted floors and wooden ceilings. Equipped with a TV and a private bathroom with shower. House Rules Terpsichori Guesthouse takes special requests – add in the next step! We need at least 5 reviews before we can calculate a review score. If you book and review your stay, you can help Terpsichori Guesthouse meet this goal.